THE STUDY DESK WITH CHAIRS GIVES KIDS A PERFECT SPOT FOR WORKING ON ART PROJECTS OR FINISHING UP THEIR HOMEWORK. 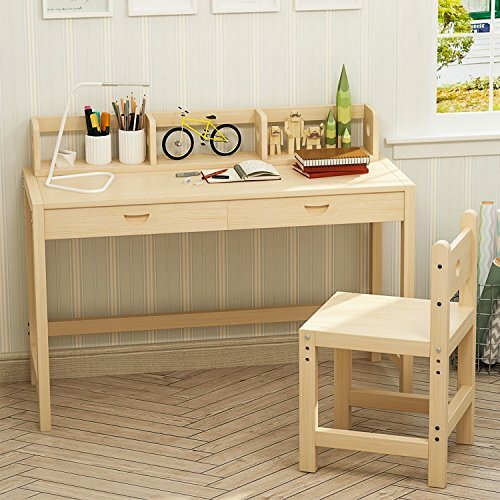 Creat a cozy and organized workspace for your little scholar with this understated desk, featuring a hutched design and read shelf for more storage aslo help keep bedrooms tidy and organized. When it comes time to study with this desk, simply pull up the matching side chair and then adjust to a fit height. Be sure to stock up in the drawers with colored pencils and other craft supplies for some artistic adventures after the schoolwork is done. •Dimension: Desk :19.6" x 29.5" x 47" Chair:15.7" x 15.7" x 29.5"
√This desk features two easy glide storage drawers that have enough space to accommodate stationery items, notepad, bills, papers or folders. The included hutch and the read shelf for more storage aslo help keep bedrooms tidy and organized, which mom and dad are sure to love. √Easy to assemble, It will took 10 minutes to put together for most people with assembly instruction help. Don't worry about the Installation , it's easy for you! √Warranty, we believe in our products, and are here to make you house awesome! If you aren't fully satisfied with our products, you can just contact us, we will provide A 18-MONTH OF FREE WARRANTY AND PROFESSIONAL CUSTOMER SERVICE TEAM serve for you. If you have any questions about this product by Tribesigns, contact us by completing and submitting the form below. If you are looking for a specif part number, please include it with your message.